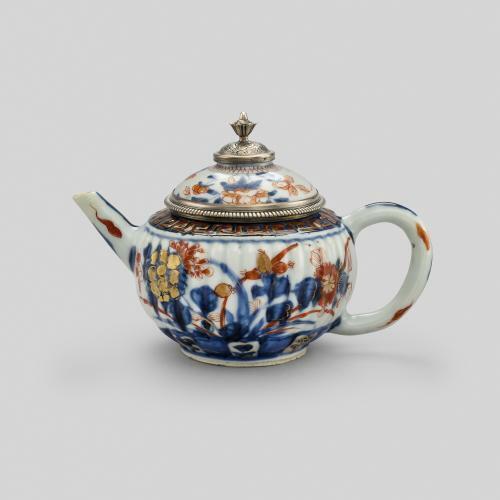 By the late 17th century, tea was appreciated in the Netherlands for its medicinal properties, and tea drinking had become a fashionable social custom amongst the Dutch upper-class. 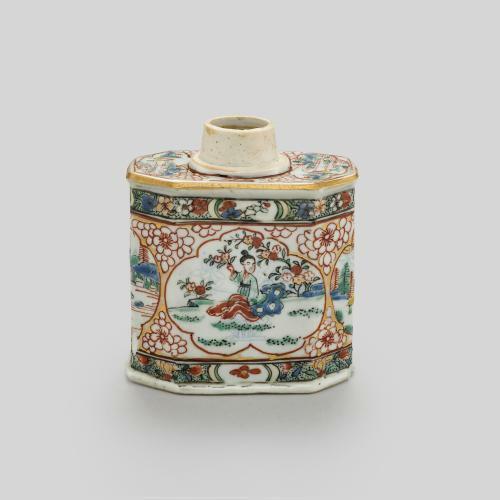 Teapots, canisters, tea bowls and saucers increasingly contributed to the vast array of fashionable porcelain wares that were reaching Europe from China and Japan via Dutch East India Company trading ships. 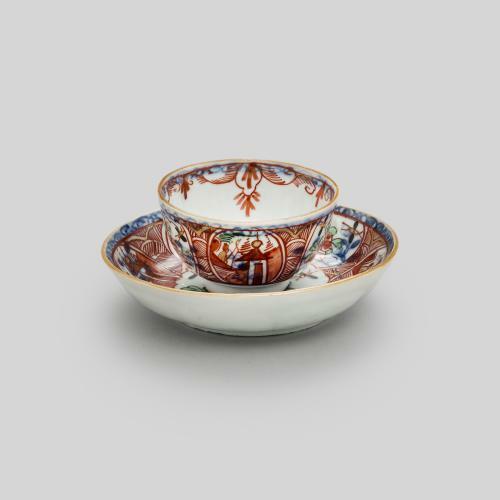 This tea bowl and saucer is an example of Chinese porcelain that has been partly decorated in the Netherlands, known as Amsterdams Bont. The porcelain was likely made in the Jingdezhen kilns by Chinese potters, who decorated the surface with floral motifs in faint underglaze blue, using the pencilled (line-work) technique. 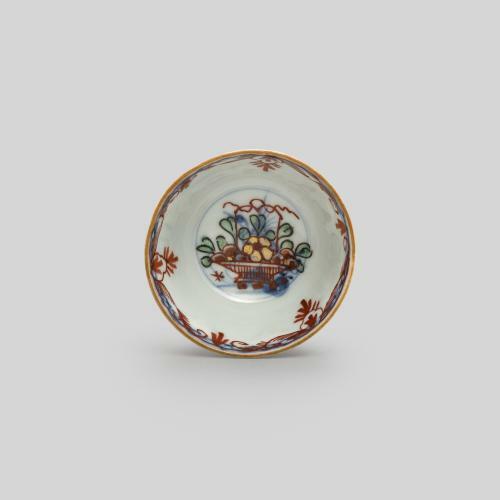 Upon the tea bowl and saucer’s arrival in the Netherlands, additional decoration was applied by Dutch painters using gilding and coloured iron-oxide enamels to add floral borders and various scenes. 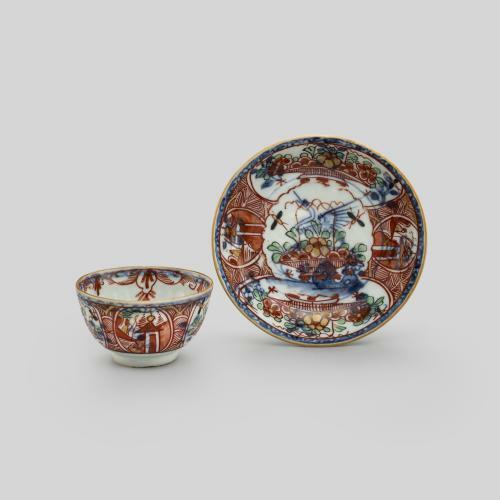 This additional decoration made sparsely-decorated Chinese porcelain more appealing to Western consumers and enabled merchants in Amsterdam (from which the name derives) to compete with colourful ‘Imari’ style Japanese porcelain, which was highly desirable but expensive at this time.